Setting up this bachelor’s first home was a family affair. 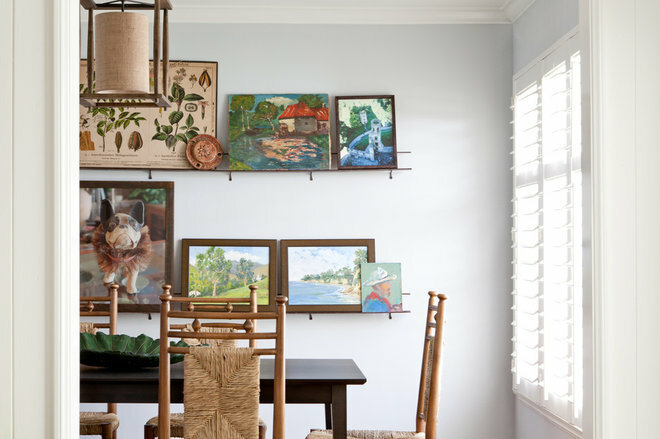 Interior designer Meredith Ellis had worked on two homes for his parents as well as his sister’s home, and family members pass around pieces collected by Ellis and his mother. At this point, Ellis is practically part of the family. “His mother and I have become great friends over the years, and she loves the design process and the thrill of the hunt,” she says. For the first house he ever purchased, this young lawyer was happy to keep the family design tradition going. Ellis took an approach that was clean, strong and neutral but full of interesting textures, adding pieces the homeowner will take with him no matter where he moves next. This is the owner’s first home. He bought it after taking on his first job as a lawyer after law school. 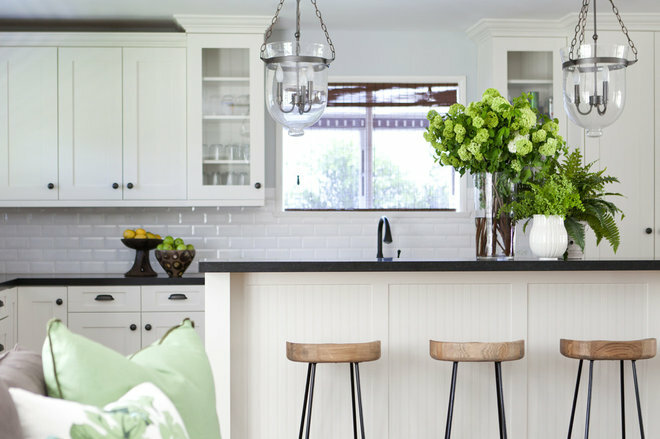 The previous homeowners had completed a renovation that left everything in great shape. For the living room, he had his heart set on an L-shaped sectional and a TV over the fireplace. “We wanted to make this room comfortable for one but also have places for his buddies to come over and watch TV or have a casual dinner,” designer Meredith Ellis says. She talked him into a chaise on the sectional to maintain an open feeling between the living room and kitchen. “We needed something round next to the sofa,” Ellis says of the seagrass coffee table. “I love to mix a lot of materials — wood, metal, bamboo, seagrass.” She also likes to mix styles. The Edward Wormley-style armchair came from the homeowner’s grandparents. 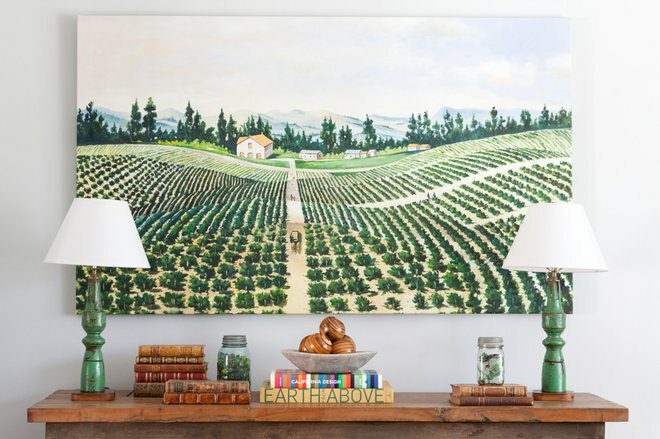 This oil painting of a Napa Valley vineyard was something Ellis and the client’s mother had had their eyes on during a previous renovation, but it had been discontinued. His mother called very excited to say she’d found it on One Kings Lane. “The piece was the inspiration for all of the colors,” Ellis says. A big part of the strategy was choosing furniture that would serve the client well for years to come. The console table is one of those pieces — it has a metal base and a wood top. Upholstered benches that serve as extra seating tuck underneath. 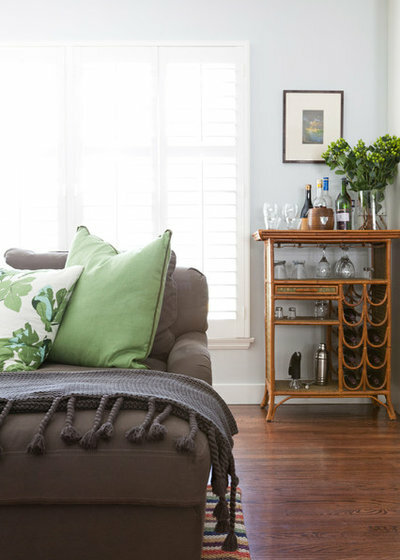 The quirky bamboo bar cart, bought from a friend, makes a great entertainment station. Ellis knew she needed to place the furniture in a way that would maintain an easy flow. She worked out a plan on paper that left clear pathways. For example, there’s about four feet between the back of the sofa and the windows. To stay on budget, Ellis did some catalog shopping while making splurges on pieces that can stay with the client forever. To fill and finish the look, vintage and antique finds were an important component. 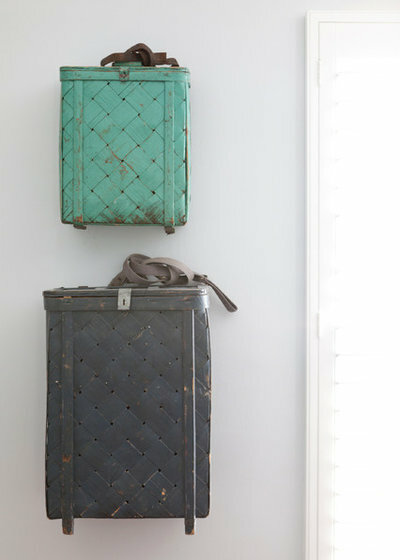 For example, antique Swedish backpacks hung on the wall add interesting textures, colors and shapes. The newly renovated kitchen is open to the family room, which makes the two rooms one great entertainment area. The previous homeowners had recently completed a renovation that included all the cabinets, counters, appliances, backsplash and pendants. All Ellis needed to do here was add bar stools. Again, they mix metal and wood. The next room is between the kitchen and the dining room, so Ellis wanted to keep the flow as open as possible. 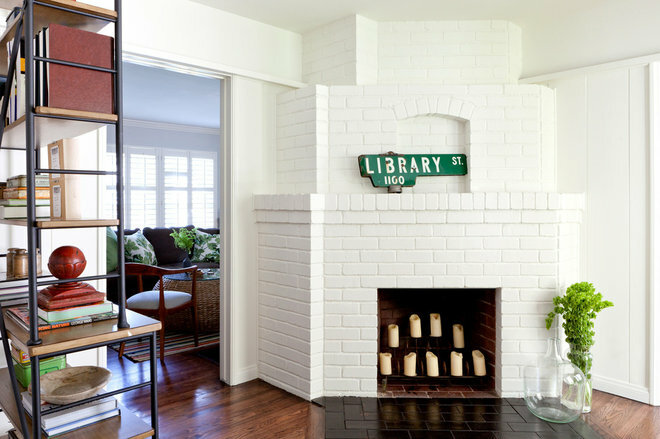 “It’s kind of an odd space that he didn’t need for anything specific, so we decided to make it a library-reading nook,” she says. The client’s mother found the street sign at the Rose Bowl Flea Market. Shelves hold some of the client’s favorite things. “We wind up starting a collection with each renovation for this family,” Ellis says. 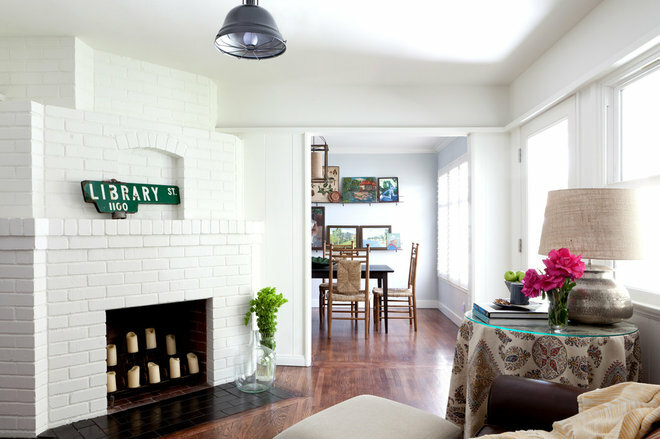 His collection, of vintage American metal tins is displayed on the shelves in this room. 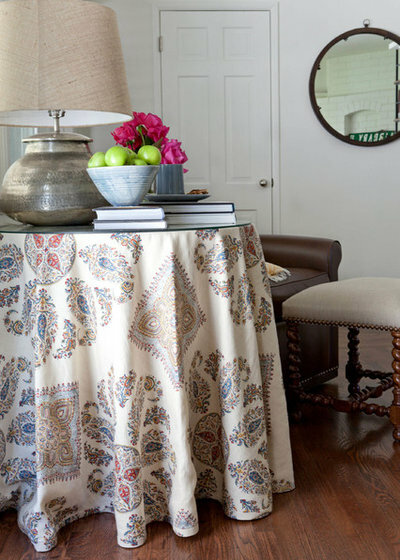 A skirted table provides a spot for a lamp, books and a snack, while the chair is a quiet place to put your feet up and read. The path from the kitchen to the dining room stays clear. Rather than hanging one big painting, Ellis thought it would be more interesting to group smaller works on document rails that she designed and had made. Mom pitched in with the two paintings on the bottom while the designer picked up a few pieces at Round Top and other favorite flea markets and antiques shops. The dog in the tutu came from Big Daddy’s Antiques. The chairs with rush seats and backs were a worthy investment. “These chairs were a splurge, but they are so nice and well-made, if he should marry and move into a bigger house someday they would be great in a breakfast room,” Ellis says. They bring in interesting textures, as does the new light fixture overhead. This full bathroom serves as the guest bath and powder room. The previous renovation left it in great shape; Ellis simply added a throw rug and window treatment. She is working on a more involved renovation in the master bathroom. The master bedroom has wall-to-wall seagrass carpet. The designer layered a striped wool rug on top for a softer feel when getting out of bed. Ellis designed the walnut bed and had it made in Texas. “We wanted a contemporary bed that wasn’t too contemporary — we went for a four-poster with clean lines and in a pretty wood,” she says. The chest is an English antique that came with the client from his law school apartment. 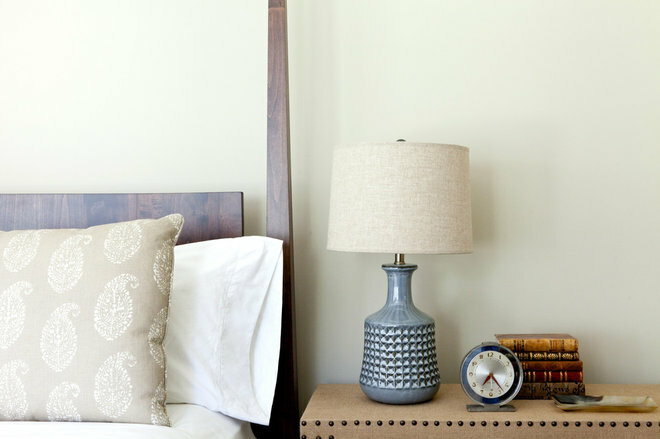 Two ceramic lamps flank the bed. “They just have that handmade American look,” Ellis says. “We mixed materials but stayed masculine and neutral,” she says. “While we wanted a somewhat contemporary look, we didn’t want anything to look too contemporary — basically, we didn’t want anything that if he winds up marrying, would make a woman say, ‘Oh my God!’ in horror,” she says with a laugh. Instead, she found pieces that will translate to other styles in future homes.